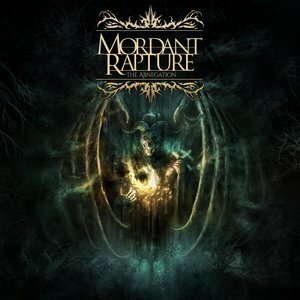 Merging together the forces of black and death metal with symphonic elements, Mordant Rapture are a fresh act out of California. Formed back in 2013, they’ve bided their time and allowed themselves leeway in order to build up a sound (something more bands could do more of nowadays). The result is an impressive EP that bodes well for the act as they continue to progress. To start, The Abnegation is one that tech-death speed freaks are going to get a real thrill out of. The music is frequently blistering in tone, capturing that rush of exhilaration when they hit their maximum velocity. However, the afore-mentioned maturity factor rears its head as well. To simply blast forward with ‘full speed ahead’ is going to make for a dull experience. For one, the band utilizes a symphonic element to inject an element of grandeur amid their chaos. The intricate playing isn’t harmed by the synth, but rather aided by it, as the frantic riffing is augmented and given a fresh spin. It gives the listener more to absorb, but it also gives it some increased accessibility compared to similar tech death bands that rush ahead at blazing speeds. The keys also allow for some atmosphere as well – as the interlude “A Plea As Above” dictates, but even each of the four tracks have their moments where the keys take over momentarily to give a slight moment of respite. The music, while clearly racing ahead, doesn’t ignore melody either – the quick tempos allowing the band to work in some catchy yet still technical riffs to keep the listener’s ears piqued for what awaits around the next corner. The Abnegation is a short but sweet introduction to what should become a major player within the tech death realm. Mordant Rapture establish that they can perform at high-octane speeds without dampening the mood or becoming monotonous with melodic and symphonic injections. Something that they’d be wise to cultivate even further as they progress.